Campaigners in a seaside resort have festooned benches in protest against "anti-homeless" bars fitted to them. Twenty eight bar devices have been attached to the benches in Bournemouth by the council, costing £3,650. 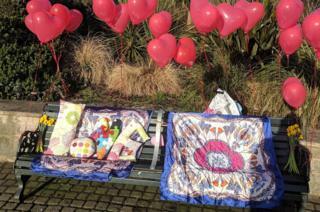 The benches have been covered in throws, cushions and decorated with balloons and flowers by those against the metal dividers. Artist Stuart Semple, who organised the temporary seat decorations, said: "Hostile design is unwanted here." He added: "We want to live in a town without spikes and bars." Bournemouth council said it fitted the bars on benches after complaints about rough sleepers. More than 17,800 people have currently signed a petition online calling for the council to remove the bars from the benches. On Thursday, rapper Professor Green, who has joined criticism of the bars, visited the seaside resort to remove an 'anti-homeless' bar from a bench. 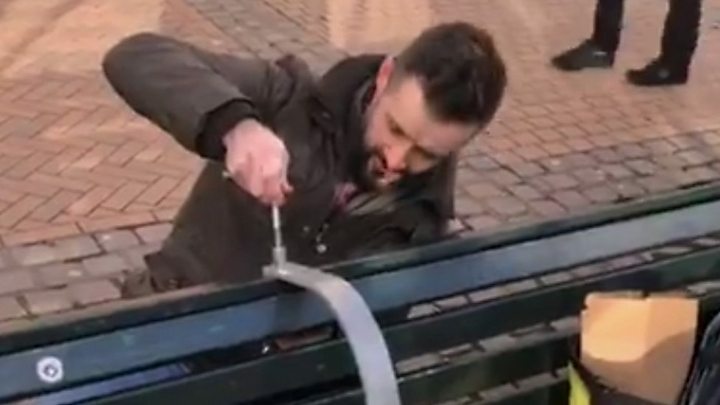 In a video posted on the rapper's Instagram designer Max McMurdo replaced one of the bars with a larger one to turn the bench into a homeless shelter. The original bar was later refitted to the bench. Last year, the rapper fronted a BBC Three documentary investigating rising levels of youth homelessness. The council said the music was part of a wider strategy to deter anti-social behaviour and rough sleeping, which could cause waiting passengers to feel intimidated.